As the curtain of the exile Tibetan elections comes down on 28 March with 100% of the ballots counted, incumbent Sikyong Lobsang Sangay has won the Sikyong 2016 election. He is ahead with 57.3% of the votes, beating rival Penpa Tsering by about 8,000 votes, and will now remain at the top post for another five years. 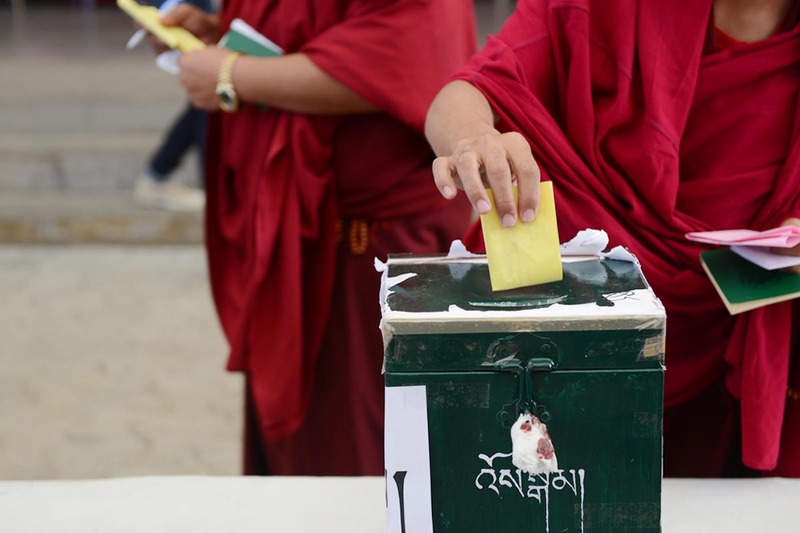 Exile Tibetans around the world cast their ballots on 20 March to elect a Sikyong of Central Tibetan Administration and members of the Tibetan Parliament-in-exile on Sunday. Polling was carried out at 85 different places around the world. The official election result will be announced by the Election Commission on 27 April. Here are the Sikyong results that Tibet Sun collected after they had been announced at the respective locality. Bangalore (South zone)Result published on 21 March.Note: Includes seven locations: Bangalore City, Dalai Lama College, Mysore, Mangalore, Andra Pradesh, Chennai and Ooty. BhandaraResult published on 22 March. Bir (BTS)Result published on 22 March. Bir (Dege and Nangchen)Result published on 22 March. Bodh GayaResult published on 21 March. Bomdila and Tenzin GangResult published on 22 March. Bylakuppe (Deki Larso)Result published on 21 March. Bylakuppe (Lugsam)Result published on 21 March. DalhousieResult published on 22 March. DarjeelingResult published on 21 March. Dehra DunResult published on 21 March.Note: Includes Deki Ling, Mussoorie, Rajpur, and Clementown. DharamshalaResult published on 25 March. DimapurResult published on 20 March. Europe (Belgium, France, the Netherlands, Spain)Result published on 26 March. GangtokResult published on 21 March. HunsurResult published on 21 March. KalimpongResult published on 21 March. KohimaResult published on 20 March. KollegalResult published on 21 March. Kullu-ManaliResult published on 21 March. KumraoResult published on 22 March. LakhanwalaResult published on 21 March. MainpatResult published on 22 March. MiaoResult published on 22 March. MundgodResult published on 21 March. NainitalResult published on 20 March. Nepal (Dhorpatan)Result published on 22 March. Nepal (Pokhara Jampa Ling)Result published on 26 March. Nepal (Pokhara Tashi Ling)Result published on 22 March. Nepal (Pokhara Tashi Palkhiel)Result published on 22 March. North America (overall)Result published on 28 March. OrissaResult published on 21 March. Paonta SahibResult published on 20 March. PuruwalaResult published on 22 March. RavanglaResult published on 22 March. Sataun (KKTS)Result published on 22 March. ShillongResult published on 22 March. ShimlaResult published on 21 March. SolanResult published on 22 March. Tashi JongResult published on 20 March. TezuResult published on 22 March. TutingResult published on 23 March. VaranasiResult published on 20 March. In the preliminary round Tibet Sun showed results of Gangkyi and Dharamshala separately. Why not this time? Not only Penpa Tsering has won in Dharamshala, he has also won in Gangkyi. I got this Gangkyi result: PT 1538 and LS 457. This despite many LS supporters from McLeod Ganj came to Gangkyi to cast their votes there. Is Tibet Sun showing open support for LS or what? Please be fair. Gangkyi vote pattern says a lot. I think both the Sikyong candidates don’t have that much hard feelings against each other. It is the supporters that created the atmosphere of animosity feeling between them in the heat of making their candidate more viable. But at the end public have the right to elect their choice of Sikyong. As everybody can see, Tibetan people are now more educated than before and know what they want. I am not happy with the outcome of the election because I supported Penpa Tsering. His victory in Dharamshala, and the speech by HH the Dalai Lama that things are not working well (read under LS administration), confirmed my view that LS is not the right choice. I have accepted and respect the people’s mandate. The beauty of democracy is that after five years LS will be done and will have to go. There will be a new opportunity and new hope. Penpa Tsering for 2021. PT la please don’t lose heart. You were the choice of the best people. We all know that the majority of the Tibetans are not that educated and aware of the politics. From 20,000 vote difference in the preliminary, you made the margin 9,000. It shows your hard work and the belief in you by the Tibetans who are aware and understand politics. LS has gotten only a few thousand more compared in the final. His victory is not worth celebrating as he lost in the Dharamshala, and more importantly His Holiness the Dalai Lama gave a strong criticism on the worsening state of affairs under his leadership. I hope LS will take His Holiness the Dalai Lama’s statement to his heart seriously and make every effort in bettering the overall welfare of the Tibetans, particularly in the settlements. It is sad and shame in Tibetan politics that one has to use H H Dalai Lama’s name to discredit LS and mislead people to turn against LS. Let us be honest, what PT have achieved or done for so many years he worked in CTA. But using Dalai lama’s name against LS is ridiculing and form of bullying LS. When Samdhong was Kalon Tripa no one dared to point finger at him when he has completely destroyed all those business establishment under Paljor department. LS has destroyed nothing, instead with his efficiency and profound political diplomacy, he has made good relationships with international political leaders with CTA especially Indian leaders. In the past six decades no kalon tripa or CTA governance has achieved what LS has achieved in just 4 yrs and 6 months. By not knowing the work culture of CTA can not discredit anyone who is elected to top job of CTA. Samdhong was just a monk who has no idea of political or civil administration, leave alone CTA work culture, and as a result all business establishments were running heavy loss under him. Should we again go down to path of Samdhong’s governance? Should he remained in a Monastery would be more effective/benefit to promote Buddhism. You are being too harsh on CTA staff. No wonder are they disillusioned. It’s always easier said than done especially living comfortably in the west. If you are not ready to dedicate your life to the service of Tibet then at least kindly don’t discourage the ones who do. How says HH: if you can’t help others at least don’t harm them. Why not possible in your volume to write all details of USA n Canada votes rather saying overall n writing few states which makes me n others confusions even though everybody now knew LS won unofficially, thanks. So you believe in Rangzen first. Me too! We have the same aim. We are Mikyul – Chikpas (those with similar aims). Penpa Tsering’s camp is accusing LS of winning 2016 Sikyong due to Phayul-Chikpa votes, although a simple arithmetic will show that this is not true. Exile Kham population is too small to yield a 58% victory. For 2016 Sikyong, you and I differed in our approaches. You stayed out of the finals because both finalists were MWA candidates. I participated in the finals in the hope of putting in office the “lesser” evil from a Rangzen supporter’s perspective. I think LS will give more breathing space for Rangzen supporters compared to PT, thereby allowing us to hopefully raise a strong Rangzen candidate by 2021. We will see if I was right or not. But I sincerely hope, for my own sake and for the sake of all Tibetans (dead, living and unborn) that LS proves to be more open minded in lending an ear to the voice of the minority. It is sad and a huge irony that the voice of Rangzen is a minority voice for a nation seeking to gain its lost “freedom”, “identity”. The last 2 words are in parenthesis because their definitions seem to differ depending on where you stand on the Rangzen—MWA spectrum. Truce to Palden from Canada, and to all who are/will be offended by my observations and remarks. I agree that it is time once again for all of us to work together as ONE. Thank you to Lobsang Wangyal for this opportunity to voice our opinions freely. I will donate however much I can afford to support you in your continued efforts to inform the Tibetan masses and the world on Tibet. Election is over, result unofficially declared, LS won. As during campaign, much has come in public view which need more transparency and honestly from LS. Hope LS will continue to work on re-starting the dialogue on his second term. Let’s all put regionalism aside, we all are Tibetans irrespective whether we are from Amdo, Kham and U-Tsang. Don’t make it easier for China by infighting among us, maligning each other. Unite against China. Pray for His Holiness long healthy life. “Let’s all put regionalism aside” it sounds good, but from this election knew that the regionalism is very strongly rooted on the mind of our people, it will take long time to reach that goal. I have to correct myself in my previous post to you. I mistakenly suggested that your “not important “remark was disingenuous, writing posts in different sites caused me to make this mistake. what I was trying to write was that you offered your analysis and I offered mine; that it’s very interesting as to why Lobsang Sangay had trouble in garnering votes in areas that he should be beating Penpa Tsering by wide margins. I believe in Rangzen first and obviously don’t support either candidate. Now that everything is done, I hope and wish everyone is breathing easy. All I can say is: Take a chill pill and relax. The candidates are doing just fine, but on the contrary, you hollow brained Knuckle heads are huffing and puffing for nothing even after everything is done. On a daily basis, follow HHDL’s advices no matter how tiny it is and you’re going to be fine. That would be my dying advice to ya’ll fools. So true vajra sattva la. Consciousness is the 1. Step towards enlightenment. All hail! Had the winning candidate been Tsoktso Penpa Tsering la, Khampa people would be already causing rifts in the Tibetan community. So better bear LS for another five years. LS, your unity guideline definitely didn’t work out. You broke our community. But for the next five years, please work honestly. I believe there should not be any choe ga sum at all, or at least at this time. We are one of the smallest population nation in the world and only about 150 thousand Tibetans outside tibet. Do we need to divide this minor number? This creates strong concept of division. I hope that you are the only one thinks like this, if all 四水六岗 think the way you are, then we have no hope. I am 四水六岗, 四水六岗 is me, you are the loser, and I a, 四水六岗 or Khangpa is the winner, this is the truth. at least for next five year. It is Penpa Tsering publicly seeking and boasting support of U-Tsang Association etc is practicing and encouraging sectarianism in Tibetan community. Pretending otherwise makes you look like sore loser! Buying and selling of U-Tsang and Ngari supports for Kalon positions publicly by pretenders in high positions in Dharamshala etc is sectarianism, not Amdo people (general public) supporting their own candidate. I am of the firm belief that this statement alone should disqualify Lobsang Sangay from leading our people. I do find it somewhat disingenuous on your part to broadly paint my extremely brief analysis as “not important” thereby suggesting that your analysis was important! What are remembered in history are the key events such as who won the 2016 Sikyong election. Small details such as how much headway the loser made in the finals compared to the preliminary vis-à-vis the winner fade away into oblivion. Phayul.com latest data says that LS secured 33,511 while PT secured 24,358. Irrespective of how much headway Penpa Tsering gained in the finals vis-à-vis the preliminary election, PT lost to LS by 9,153 votes in the finals. And that is significant for the following reasons. 2. LS will leave the Sikyong post in 5 years’ time knowing that he won the first in a land-slide victory and the 2nd in an equally illustrious way considering the Regionalism Politics unleashed upon him by Penpa Tsering and a few unscrupulous individuals of the U-Tsang Tsokpa executive board. 3. Even if Penpa Tsering wins Sikyong post in the future, he will never have the satisfaction to have won over LS. BTW — another point of view — the Prologue to this amazing story of PT gaining votes after the Prelims: Just read Tibetan Political Review’s recent editorial “Flipping Tibetan Democracy“. Part 1 deals with Ngari Assoc changing their choice of candidate overnight after a deal was struck with U-Tsang Assoc, and even a deal thrown in by PT. The Epilogue? For now it seems the wheeling dealing and other some such worked … BUT only half way. Not all got carried away! See the SL is winning the Sikyong 2016. That is what I want since long time. Mr. Tsering said a lot about his parent, brothers, and sisters as his family. But he never said a thing about his wife and daughter. (I believe he has) I still don’t know. Can anybody tell me, what is the problem? On the other hand I saw Mr. Sangay’s wife and daughter twice on TV. I also think Mr. Tsering has a quite reputation of drink and fight. Glad it is over. This year for our Sikyong elections I believe I share the pain with some of the Republican primary voters in the US with their choice of either Donald Trump or Ted Cruz! I couldn’t find a way to vote for either LS or PT — both candidates I believe are deeply flawed in their own ways. What I find very interesting from the preliminary election in December was that Lobsang Sangay received 30,508 votes and Penpa Tsering received 10,732, and in the final elections LS got 32,056 an additional gain of 1,548 and PT got 24031, an additional gain of 13,299, which basically shows that Penpa Tsering got 90% of the additional votes cast for both the candidates. What I also find interesting is that LS lost in Dharamshala where he has been living the last 5 years, won Darjeeling his hometown by only 60 votes, and Boston where he lived for 16 years by a mere 2 votes. Did the debates and the resignation of Dickey Chhoyang take the shine off LS? Or is it that the people who know him best wouldn’t vote for him? Palden la i noticed that too. Anyway for Tibet’s sake we need them both i think. Bhod gyalo! Dear Tibetans. Please pick Penpa Tsering because Lobsang Sangay didn’t even help the Tibetans. If you are Tibetan you have to care about politics and know what’s going in Tibet. Also Lukar Jam said that the Dalai Lama didn’t free our country, but to be honest it’s not going to be immediate it takes time. So don’t pick for Lobsang Sangay because he didn’t help and he said he had done all the work to support or help the Tibetans even though Dalai Lama did all the work to support you guys. So I want you Tibetans to vote for Penpa Tsering if you care about Tibetans and our religion. And if you don’t understand me it’s because I’m only 11 typing this up. I am a pharmaceutical market consultant and analyst by profession. I just couldn’t refrain from doing a quick analysis of the data from 2016 Sikyong Election. For a data analyst, Phayul.com’s way of tabulating the data is easier to analyze. So, my analysis is based on the 76 locations that Phayul shows data on. (a)	LS won majority (53% or more) vote in 12 areas. 3. LS tends to get majority vote in overseas areas**, especially the areas with blockbuster votes. (a)	Of the 12 blockbuster areas where LS won, 2 each are in Europe and North America, and 1 in Nepal. 1. Of the 76 locations, PT won majority in 19. (a)	PT won the majority in 4. (a)	The Chigyal areas where PT won a majority are all in Australia. (b)	All the areas in Australia have small votes ranging from 22 to 55. The only exception is Sydney (502 votes). 4. Except for Australia, all the areas that PT won a majority are in India. (a)	Dharamshala is the only significant “city” where PT won a majority. (b)	The other “cities” where he won a majority are insignificant in the sense that the total vote bank tended to be in the 2 digits (Mysore, Chennai). The exceptions are Bangalore, Kalimpong and Gangtok (240, 455, 650 votes). (c)	The areas in India where PT won a majority are remote settlements, usually the smaller ones. a) Face of the more sophisticated Tibetan populace. b) International face of Tibet. PT has served almost half of his life for Tibet, and continues to do so. Best would be tandem. I agree with Migme Dorji from Dzambuling about the voting system. It would much much better that Penpa Tsering la does not win the Sikyong post, as i was always worried about his static thinking and harsh treatment of those Tibetan citizens whose ideology and political stands differ from his. And he is always using His Holiness’ name for getting public support rather than blowing out his charismatic leadership which is totally blank in his gene except for being a bench warmer in Parliament for the last 20 years. Neither will the incumbent Sikyong fulfill public demands, but he will not humiliate the post of Sikyong. Maybe PT is honest and has had 20 years experience in the Parliament, but many people have doubt as to how he would handle the post; it’s not about handling 40+ people nor Gangchen Kyishong, but it’s about interacting with world leaders and highly intellectual people as well as scholars. Hence, we need a Sikyong who has the capability to compete in a world politics scenario. Personal attacks between the sikyong candidates were indeed ugly. I thought Penpa Tsering took advantage of having access to internal information being a speaker. Too many inside secrets revealed to the public. Folks at Tibetan poli review have similar views. LS deserves a second chance since he seemed to be in the middle of lot of projects beneficial to the masses. good thing between the two was the show of determination to do something for the cause, and this is something every Tibetan must learn from these two gentlemen. PT should stay strong, for he has chance to win in the next election. Whatever things he have in mind to change the system for good must be implemented if he comes out victorious in the next election. Although what will transpire in the next five years is hard to say, anybody might come into picture and take everybody by storm just as LS did in 2011. For now it is upto LS to live up to the expectations of our people who have given their precious votes. I’d like to urge him to make our movement stronger, and as his second term nears its end in a few years, to end with a big result in the resolution of our crises, rather than spending more time on internal development. We are more concerned about going back to our land. Aren’t we? Lobsang Sangay ran for 2 elections- Sikyong 2011 and Sikyon 2016 and won in both. Penpa Tsering ran for only 1 election- Sikyong 2016 and lost. LS is for the short run, PT for the long run — best man for Tibet. No doubt. Best formula: 2 for the price of 1. To me the saddest episode of this election process was Samdhong skipping his vote. I felt that it was a show of narrow view and an unrealistic approach to an election without competition. It seemed like a narrow-minded Lama politician falling into extremes. What about vendittive competitive responses on those who criticized him. There was no compassion and limit. Please be realistic and let the younger generation do their job. Maybe is better to stay retired and don’t be involved. Samdong is indeed hypocrite. Lobsang Sangay (hope this is right spelling, amid all these spelling issues) won this election because he was involved with the people either personally of through his reps. He went to remotest of remote places to just know how it is to be like there. When Samdong became katri…he never visited ladakh or any other places where the Tibetan government’s back bones lie. He was quoted as saying, when he travelled to leh as part of mandatory parliamentary visit, that What a poor place is this, I will never ever come to such place ever again, if it was not mandatory, I wouldn’t have come this time too”.. Such is his love and cooperation to the poor people and he has the guts to say he boycotted this election because 2 candidates lack cooperation. Mr. Tibetan Mohan Bhagwat…please go for a retreat and don’t come back any sooner. Tibetans really don’t need some senile psycho to dictate what to do. You have failed miserably yourself as a PM and all Tibetans during your 10 years of stupid rule. Bohemia Gyalo! We can’t say like such a point to anyone. Rinpoche has his own perspective, with the help of love and compassion. Actually, Rinpoche expressed why he did not vote this time because in our community there are lots of politics played out between two sikyong candidates’ name and misguided before 20th March. It might not have appeared in western side, but in India it was a lot. Right now, our Tibet problem is not solved. PLA government high people are looking to words us. Might be you are not interested to read international news papers. What they are talking to words us at the time of vote. Read some newspapers from Lhasa — what they are talking on us. My perspective is that this time sikyong election to much according to as a refugee in outside of our motherland. Why the Central Tibetan Administration assembly has not make a mult-iparty system and two-party systems, because there were a lot of reasons. May I request you read some books which have been written about CTA history. This time it never happen like Indian election. Some they are deploying a lot of police. Why? Ask your self. Rinpoche has seen how future Tibetan refugee people behave. It will never and ever help the Tibetan political solution. You might have seen in Facebook or Wechat or other social website, what His Holiness has said in one of his speeches. His Holiness said, “might be I will live twenty years or thirty years. If you students and younger generation Tibetans will take and go through my advice then I will die peacefully. If you will fail to do it then I will die without peace.” So, which you want? If you really love these two rinpoches, how can can write such a point towards rinpoche? Why I voted for the incumbent Sikyong? 1) I am from U-Tsang but the two candidates for Sikyong are non-U-Tsang. This gives me freedom from accusation of playing dirty sectarian politics for personal and sectarian gains. The same cannot be claimed by people holding high office trying to influence the outcome by playing Tibetan people as mentally-challenged fools to be taken advantage of for sectarian and personal gains. Penpa Tsering La boasting support of the U-Tsang Association, thereby, practicing and encouraging dirty sectarian politics. 2) There is a serious allegation against Penpa Tsering La that instead of helping Kathak Rinpoche in running a restaurant, he took undue advantage by having an affair with the lama’s unfaithful wife. In the process the diabetic and depressed lama passed away, and Penpa Tsering la benefited economically and otherwise from the death of Kathak lama. 3) The Kalachakra controversy would not have been possible without Penpa Tsering la’s candidature. 4) But for Penpa Tsering La, it could have been a more educational and meaningful election campaign about Rangzen by Lukar Jam la vs UmayLam by Lobsang Sangay la. What a lost opportunity! 5) Tibetans in Tibet are giving up their lives, but Tsoktso la would not give up alcohol to preside as a political leader of HH The Dalai Lama and the Tibetan people. 6) The known experience and performance of the current Sikyong will continue. 7) To send a clear signal to any highly-educated and potential future leaders of Tibetans that the vested sectarian dirty politics can be overcome. 8) Do not let history repeat itself. Reting Rinpoche (helped find our 14th Dalai Lama and was trusted and appointed at 21 years old by the 13th Dalai Lama) and Khewang Amdo Gedun Choephel and many others were murdered by old ruling class Tibetans in then Tibet because they were not part of the ruling class but possible danger to the status quo. The same can be done by new ruling class Tibetans — sectarian politicians with overt smooth talk and covertly playing Tibetan people as mentally-challenged fools to be taken advantage of in promoting sectarian goals, thereby, ultimately for personal gains. This year the Sikyong Vote system was disappointing.. Only two Candidates. I am tired of Sikyong Lobsang Sangay la same old boring talks and stories. Sure he is going to win this election as there are all his phayul chikpassss pass pass….. Gonna vote for him no matter what. This time we Tibetans have failed to bring a good discussion and good debate, but only with all those awful blame games and pointless arguing. However we have learned a little and that matters the most. Our system is new and so are our experiences. Sorry to say that. Now it’s time to change: We lost our country because of China who just thinks about self and money — when we lose, don’t lose the lesson: It’s time to stop corruption. It seems like, in the same post saying people should not engage in blame games, there is blaming a whole group of people as loyalist. I am not from same phayul as Lobsang Sangay la just to make it clear. But it seems there is this mentality that he belongs to a certain phayul first, then only he is Tibetan. But not all people see it this way. It seems like you believe that just because majority of Tibetan don’t think the same way you do, there has to be something fishy going on. But in actuality people think differently and see things differently. Some think pink is a horrible colour, while for some it’s the most beautiful colour. Also, I don’t think being bored is a good reason to change a shampoo, let alone PM of our government. It sure seems like all that people are saying is “My candidate is so great he can move a mountain”, or “Everyone knows that my candidate did this or didn’t do this.” Isn’t it obvious that everyone does not think exactly the same way? They say we should communicate and discuss to move forward in a democratic process, but we Tibetans never seem to be able to do that, and I think that is because we never discuss but argue. We are always engaged in blame games, spreading rumours and lies. And there is no one willing to listen, so the whole argument is pointless. This election has shown that the best path for the Tibetan community and our government is not this way. Direct election of Sikyong is not the best way, better either vote from parliament or else not have one leader but use 7 leaders like in the Swiss system. There is value to the Swiss system for us at this time in our governance. Swiss system of rotating “presidency” amongst the 7 parliamentarians from different parties will allow for leadership experience and exposure during the lifetime of His Holiness. Yes I fully agree with you. Election of one person directly by the people is very dangerous, specially in third-world countries like us as yhe majority of the people are not so well-informed and educated to make a sound judgement about the candidates. So from last and this election it has become very urgent to change our system before we are doomed. Yes, those acts of Penpa Tsering are exactly the reason that prompted me to vote for Lobsang Sangay. Who does Penpa Tsering think he is to “Guard” HH from Lukar Jam? And where is the need to “Guard” HH from Lukar Jam? Lukar spent time in Chinese prison for the sake of Tibet. He is a HERO, if anything. How can someone who braved Chinese prison for Tibet insult the very symbol for which he suffered bravely. HH is the symbol of the nation! It is an insult to all Tibetans when Penpa Tsering “guards” HH from Lukar. We all know that Lukar Jam did not dis-respect HH. It is just a figure of speech. But Penpa Tsering made a huge fuss of it and demonized Lukar for his own personal gains. I believe that the true reason for doing so is that he wanted to monopolize the Amdo votes by eliminating Lukar from the race. By refusing to debate with Lukar, he prevented any meaningful discussion on Rangzen vs Umaylam from taking place. As a result, the debates for final election were reduced to a mud-slinging competition for inconsequential, petty matters. If Penpa Tsering hadn’t been so nasty to Lukar Jam and if PT hadn’t been so anti-Rangzen, I would have stayed neutral. But these very acts of Penpa Tsering prompted me to vote for Lobsang Sangay. Lobsang Sangay wasn’t so nasty at least. Think of all the other people who may have voted for LS for similar reasons to me. Don’t drag HH into each and every matter for your personal gains. Tenzin chodon la i don’t know who you are, but i don’t think you should write amdo words that will be not good in people. Whatever you like to vote, just do it, but don’t blame our chitue tsoktso Penpa Tsering la. I think Tenzin Choezom la is right. It does seem like Mr Penpa Tsering la is using His Holiness’ name in every speech of his for his own benefit. Everybody knows that. Kundun ki tsen pak sasa maa nang rock nang Penpa la. Penpa Tsering la is the right man for Tibet. Do you think so?? Let rest of the Tibetans decide on 27th April. He is not using His Holiness’ name whenever he gives a speech — he usually talks about His Holiness before giving his speech. You have to watch it, Namgyal la. Its saddening to see that Lobsang Sangay la followers are trampling on the others. Be conscious that will only shine a bad light onto Lobsang Sangay la and omen for his tenure. In winning/losing moments the real character will reveal. Shedey! Whoever win, he should work 100 times harder than before. He must just focus on the real cause rather than mixing all up religion and politics, that makes our community confused, unnecessarily going against each other. Why I choose Lobsang Sangay? 1) As the Wish of Tibetans inside Tibet. Because They always sing and song For Lobsang Sangay. 2) HH Many times Admired to Dr Lobsang Sangay. But I never Saw and Hear HH admired to Penpa Tsering. 3) We are not Economic refugees, We are Political refugees. So The Tibet issue should send to international platform is more important then any other things. On Wednesday 23 March at TMAI (Tibetan Medical and Astrological Institute) celebrations, His Holiness reprimanded the CTA Health Department, and consequently Lobsang Sangay la, in public, and strongly so. I agree with you that Tibetans inside have sung a song for Lobsang Sangay la but when?? Why??? Just after he became a political head of Tibetan exile government, not before that. 1. It is because he is the head of the Tibetan exile government and people inside Tibet have been expecting huge success from him. Moreover they respected the seat which was long held by His Holiness and now by Lobsang Sangay following him –which is the reason why they have sung for him. 2. His Holiness admired both of Lobsang Sangay la and Penpa Tsering la. Sikyong has more responsibility than Tsoktso. Especially all the international relations are under the sikyongship, so he might have appreciated more, but that does not mean Penpa Tsering was not appreciated..
3. You said we are not economy refugee but we are political refugee. Yes it is true. But unless and until His Holiness lives, naturally our international campaign will shine always and the international communities will support us. His Holiness has done everything for us. What is the most important for us?? 1. Unity and following His holiness advice. 2. Never ever forget the kindness of His Holiness and make sure that he won’t be upset by unfollowing his advice. 3. Achieving a better Tibetan exile economy is very important because unemployment of youths is a threat to our unity. Thanks for your great information for voting count update. Please tell to Dhasa why it takes such a long time to count result. We have doubt what is the secret there. Hope they will do it soon. I do respect that Penpa Tsering la served the Tibetan establishment for 20 years in various capacities, the latest being Tsoktso. May be he is Tsoktso material at best and nothing more. Not really a material to become the Head of a Government. May be he should continue being the Tsoktso for the rest of his life, i.e. if he gets elected as an MP first. I suppose for the post of Sikyong, you need intelligence, positivity of thought no matter what difficulties you face, you need the vision to look far, an inclusive policy to engage everyone constructively, and you need charisma. How many of these characteristics does Penpa Tsering have? His non-stop complaint against everyone, starting from Karma Choephel la (deceased) and now towards the current Sikyong makes you think that Penpa Tsering may be a very unhappy person at heart. In his heart of hearts, Penpa Tsering may be very dissatisfied with himself. His facial expression is that of someone who is constantly unhappy, thinking bad things. You don’t need to be handsome to have good expression. Even ugly people have good facial expressions if they are happy people. To me all his rants seem to show that he is jealous of what Lobsang Sangay la stands for and the characteristics that LS was born with which he himself doesn’t have. So I doubt if he has done any good for Tibet after all. But if you insist he has done a good job, let him do it in whatever other capacity that comes his way. But the people have made their decision — and that decision is NO to Penpa Tsering as The Sikyong; and YES to Lobsang Sangay as the Sikyong. It seems like first you said Penpa Tsering la is opposed to Lukar Jam la. Now you are saying he is against the late Karma Choephel la and Lobsang Sangay la … Find the reason he has against them all…. 1. Lukar Jam called (lagen) and (gal tsongpa) to our beloved Holiness. 2. Karma Choephel made His Holiness upset by saying that His Holiness was struggling for complete independence by heart but just saying middle way by mouth (which is the same as what China says). 3. Lobsang Sangay first started criticizing Tsoktso and he just cleared the air, and the dirty politics played by Lobsang Sangay (Vote bank policy) was used during his campaign. Dukor wangchen dirty politics which again made his holiness upset. I think still the election result from a few locations is yet to come … Dhasa, America, and Canada, to name a few. Kindly update once it is confirmed. Thank you once again. Thank you Lobsang Wangyal la for the wonderful job and timely updates on sikyong election. It seems Lobsang Sangay la will retain the same position. My hearty congrats and best wishes to him. Whereas, Penpa Tsering la is concerned i really appreciate his dedicated service to our community over the last 20 years and is still striving hard, but somehow i personally feel that sikyong post is something different and LS is better choice over him! Varanasi Penpa Tsering campaign for sikyong candidate has yielded a negative result as wholesome in our community. Only a few students lent his voice. To my view, he has an ego from being old staff and comparing his own towards Sikyong Lobsang Sangay the Harvard alumini. Who is Tharlam Dolma? A supporter of Penpa Tsering la. I believe that she doesn’t deserve to act for sikyong candidate as she has denied the chitue direct post and went against the will of H.H. the Dalai Lama. I believe that she was fooling the audience but she couldn’t succeed. Why Penpa Tsering la lost? 1) He always accusation on Lobsang Sangay, from start of campaign to end. 2) He has no new ideas. 3) His early talk and later talks are not the same. 4) His supporters are genuine for Tibet Issue. 5) He play by Dawa Tsering. That way U-Tsang People do not support him. Also – he trashed Lhukhar Jam. He is old school – same old same old. Please think before you say something in front of the public, specially when you are writing something (analytical issue) on public domain. Be careful. Despite this unofficial votes has displayed Tsoktso was lost to Lobsang Sangay, but other sides of this votes has shown the huge number of votes of Lobsang Sangay lost to Penpa Tsering la if you compare with the preliminary votes. Think well, this clearly shows the effectiveness of Penpa Tsering’s campaign and the positive response of general public to the debate to his future plan. Moreover that debate also contributed huge increased of shares of votes to Penpa Tsering and declined of shares of votes from Lobsang Sangay. Thanks for the updates, Lobsang la. Keep up the good work and I am sure you will reach your success and enjoy the journey meanwhile which you do. By the way, seems the incumbent Sikyong is leading by quite a margin. Lobsang Wangyal La, Thank you for the updates. Whoever wins the Sikyongship, they need to work hard for the Tibetan cause. The campaign and criticism must end with end of election. Now need to focus on how to move forward to have better and stronger freedom struggle. We will gain nothing by criticizing each other; instead we will lose our strength of unity. Whoever wins, it’s the people’s decision in democracy. So let’s stand together and move forward for our common cause. 1. LS is winning despite the intense negative campaign from PT camp. 2. LS is winning despite the regional politics game that PS set into play. 3. Aiming to win votes by hook or crook (just as PT did) is not appreciated by the general masses. U-Tsang in exile has formidable numbers. Penpa Tsering not only tried to tap into that number, but also tried to monopolize the Amdo vote. Unfortunately for PT, U-Tsang people proved to be not as gullible as he imagined them to be. 1. PT was terrified of Lukar Jam’s intelligence, his command over Tibetan language, and his sharpness of thoughts. PT knew that he was no match for Lukar. 2. PT wanted to eliminate Lukar in the preliminaries so that he can monopolize Amdo votes in the final. 3. PT has no tolerance for anyone who support Rangzen. This is evident in the way he tries to smother the voice of SFT, TYC, and any other Rangzen supporters. The result is still not officially announced. So it is too early to say. But between the two, I would be less asahmed of calling myself Tibetan if LS wins the Sikyongship. It is unfortunate that for many, the choice was in finding someone who is less offensive and less harmful. Neither candidates have any solutions for what ails our struggle. Penpa Tsering la supporters did not have a monopoly over negative campaigning. As an uninterested bystander, I thought that Lobsang angya la supporters won on the nastiness scale of negative campaign — alcohol bottles and “murder” charges. Most of us know that LS has a deficit in integrity and truth. I agree with you that at the end of the day, PT’s efforts to demonize LJ and shut any discussion on the issues invoking HH and dragging HH into the preliminary against LJ harmed him. He continued on that theme with dragging HH into the election against LS using the Kalachakra controversy with no regards to HH. LS will win this election. I just hope that smaller margin will make him more humble. As for the future of Tibet, I do not have much hope for either of these two candidates. I hope we can elect a strong Chitue to balance things out. I am clinging to the hope that LS will be smart enough to use his five-year term to focus less on his own selfish needs and more for the struggle. I see it like this: Penpa Tsering la is current Parliament speaker (Tsoktso). He has been serving Tibetan exile government since long back. Therefore I don’t think we should be so critical of him. It is said that Lukar Jam la called (lagen) and (galtsongpa) to our beloved Holiness the Dalai lama, which was the primary reason why Tsoktso Penpa Tsering had called off future debate if Lukar Jam la got through the preliminary votes. There is nothing of fear of debate with him — we shouldn’t malign the real issue into further controversy. Please respect him because he has served the Tibetan government more than 20 years, which i think should be respected. Thank you. Thank you for compiling the results. We’d appreciate if you could also add places whose results are not yet out with a remark indicating waiting for results. Why is it taking so long for Dhasa result to come out? instead for celebrating your candidate’s triumph but not at the cost of affecting others sentiments. Penpa Tsering has been serving the Tibetan people since long back. Even if these unofficial votes presumed to be a final which says Penpa Tsering has lost, but I think he has nothing to lose. We have lost one great man who could contribute something for Tibet. Thanks for your precious contribution L Wangyal la. Democracy is live and let live. Now all is said and done. Lets turn the page and let the river flow smoothly and take its course. Today is better than yesterday — tomorrow better than today! We are still awaiting the results of dhasa and north America. We are optimistic of Dr Sangay based on every angle. His visions are clear and long term, as a great leader. We have seen his performance and yet to see a bigger role. Let’s hope and pray for his victory in the remaining uncounted places. Very happy to see the results, LS. Positive campaign, and focus on issues. Expect wider gap as votes still counting. I wish our incumbent Sikyong all the best. Lets learn from this campaign. Negative campaign means losing for next Sikyong. Good Luck, Dr. Lobsang Sangay. The real story of these early results is the fact that Lobsang Sangay lost actual votes from the preliminaries. Penpa Tsering has already received 60% more votes than the total votes he received during the preliminaries. In some communities, Lobsang Sangay has received fewer votes than the preliminaries. It looks like he will win this election. His supporters will have to urge him to take a principled leadership in building a unified Tibetan community moving forward. All because of a negative campaign by the fabulist PT supporters at all cost, they even didn’t spare HHDL. Lost the support of Rinpoche’s vote, that speaks volumes. You are doing a tremendous job Lobsang la! Penpa Tsering La is not a Hllary Clinton, who did not run against the Obama for re-election. In the USA they tried it in the beginning but proved to be not a good experience even though the winners and the runner-ups pledged their lives, wealth and their sacred honour for the independence of the USA. Besides, the election campaign was reduced to silly politics of whether HH The Dalai Lama pretended postponement of the Kalachakra, or the pictures of political or religious leader should be displayed properly to everybody’s likings in the Office of Tibet by a clerical staff. Also due to Penpa Tsering la’s participation, we lost a golden opportunity of debate between Rangzen and UmayLam. Off course, Dicki Chhoyang la’s betrayal is enough lessons, not be fooled twice to say shame on the Sikyong! Well, finally we are going to see the result, which is showing quite neck to neck, though there is a sign that the incumbent Sikyong is securing a comfortable lead over the Speaker PT. I feel that the very aggressive campaign by the few supporters of PT as Chitue or senior retired officials did more harm than help in this result. He should have maintained a very positive and disciplined campaign to win, but unfortunately, or being too smartly carried away by critic after critic, and so serious and sensitive as Kalachakra issue, did not came out well for the general public. Well, let us still wait and see to the end. I totally agreed with Tenzin from Canada. Both our sikyong candidates are well qualified, talented, and model personalities to our community. But the U-Tsang and other association aggressive campaign has led my own vote to Lobsang Sangay. Many of our fellows too had the same feeling. I was wondering why Tibet Sun is uploading results late this time, compared to a few other websites? I didn’t want to participate in Sikyong 2016 Finals after they eliminated Lukar Jam. But participated after all because I couldn’t let a dictator like Penpa Tsering win. I voted for Lobsang Sangay because I find him the lesser evil compared to Penpa Tsering. Penpa Tsering will smother every voice different to his own. The worst thing is that Penpa Tsering doesn’t know what his own voice is simply because he doesn’t have a core principle. Authoritarian men without core principles are dangerous because they tend to get paranoid at each and every little perceived “opposition” to their authority. Not that Lobsang Sangay has a core principle. At least he seem more liberal than Penpa Tsering. I quite agree with you. In a democratic process of election, there is a need of debate or dialogue between the candidates, and whoever might end up as a candidate, the other candidates should be able to debate and talk with each other for the sake of people’s choice and freedom. Seems LS is leading in both the places.. Superb service. Thanks Lobsang. Free Tibet, long live His Holiness. Smart people are not always good; good people are always smart! Thank you Lobsang la! For this initiative… Hope we get to see live updates as and when the results are declared all over… Just writing in to appreciate your efforts! Thanks for keeping us updated with the election result. We really appreciate your wonderful service. Keep it up! Comments on this post will automatically close in 3 years.